Walk into any room. Does it feel comfortable or unfinished? Does everything tie together, or does it feel jarring? Chances are, the difference is in the rug. As one of the biggest items in any room — larger than all the furniture and the art — the rug defines the room. The right rug can define your space, bring your design together, and warm it up for people to relax and linger. The wrong rug can look oddly out of place or contrast harshly with the rest of your room. But choosing a rug could be a bear, with all the materials, sizes, colors, and patterns. And choosing rugs for a whole new house? Ugh! After doing that numerous times, I decided to jot down what I’ve learned, spoke with several rug makers, and looked at how we live today. Finally, I also read up on what the world’s top designers suggested (which I summarized here). In the end, I came up with these simple, room-by-room guidelines on how to choose an area rug for your new house. Outside the house, a simple weather-resistant floor mat is best. Choose an oversized one to accommodate multiple guests (and all your UPS packages) at once. Once you step inside, the foyer should set the tone for what will follow next. If you have a fabulous handpainted medallion on your floor, by all means show it off and avoid putting a rug on it. 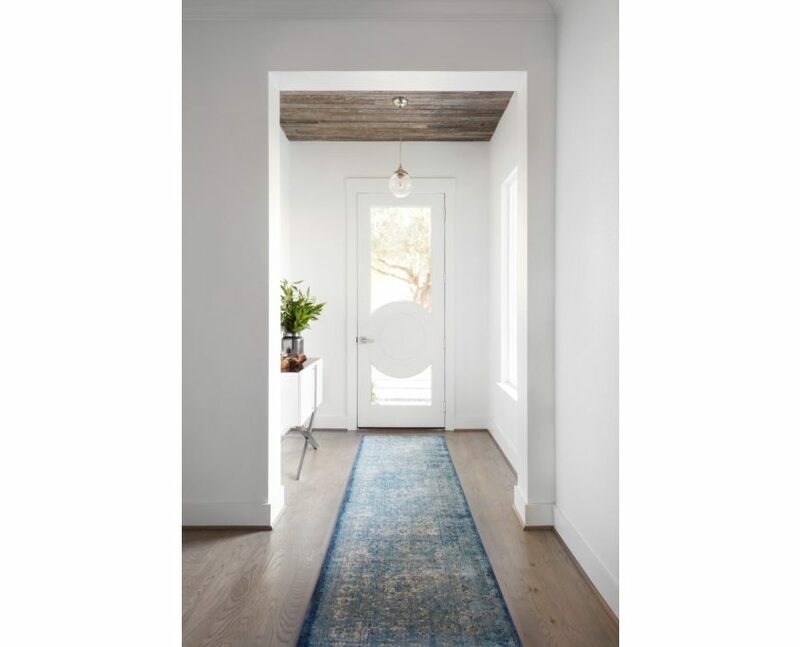 Otherwise, a rug in the entryway will make your home feel more welcoming, especially if you have marble floors or a lot of furniture in the space. The combination of a soft landing and a warmer texture will instantly signal that you’re now inside private quarters. 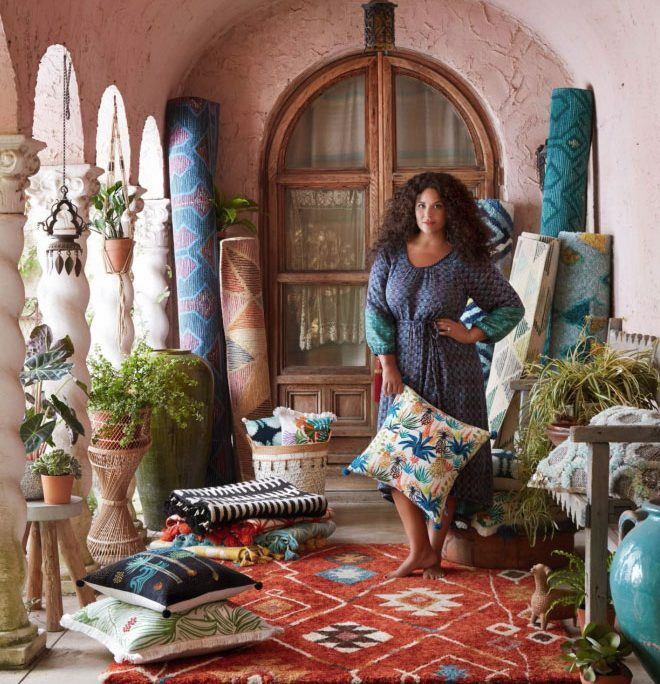 Although the outdoor rug has done much of the heavy lifting, go with a durable, low-pile or medium-pile in a forgiving color to handle foot traffic. You don’t want guests to hesitate before stepping inside; wool is a great choice since it’s the easiest to clean. If the door will be opening onto the rug, measure the height of the rug to make sure it will not be in the way. If you have a double-entry door, find a rug that covers the width of the entire opening. 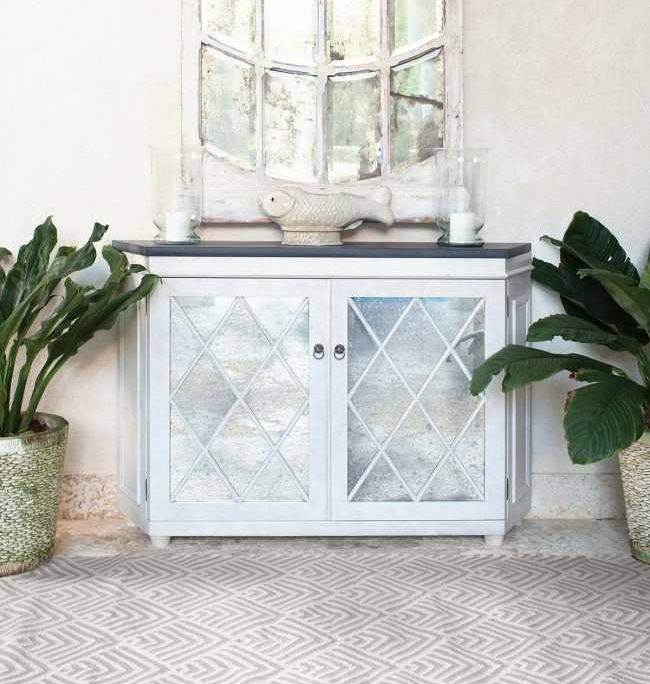 Your entryway rug should be wider than your front door; large enough to feel like a real landing rug. See how this runner effortlessly warms up the space and leads you into the home? Round rugs look great with double-entry stairways. Make sure you use a rug pad under entryway rugs to keep them from slipping. In the living room, area rugs are used to either anchor a seating group or delineate a space. Since living rooms typically feature beautiful flooring, use a rug that shows a nice border on the floor (approximately 18″ all around). Even when you’re placing furniture against the wall, it’s nice to see the rug framed by the floor, so be sure to leave enough room all around the rug. The contrast will help focus your eye more. As they are the most formal reception rooms, get the best rugs you can afford for your living room. They will leave a lasting impression. You can either go with a bold pattern (to complement a stunning piece of art), or you can go with a soothing option that either coordinates with your room or the view outside. See how the rug in the picture below picks up all the colors in the room? 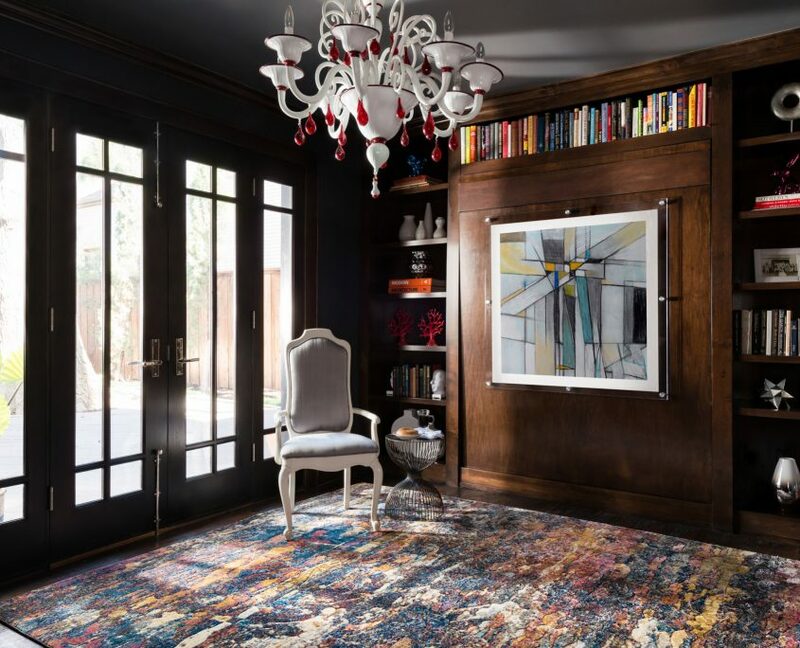 This stunning rug makes certain that your eye doesn’t just linger on the chandelier, the bright books, and the art … it helps bring the whole room together! 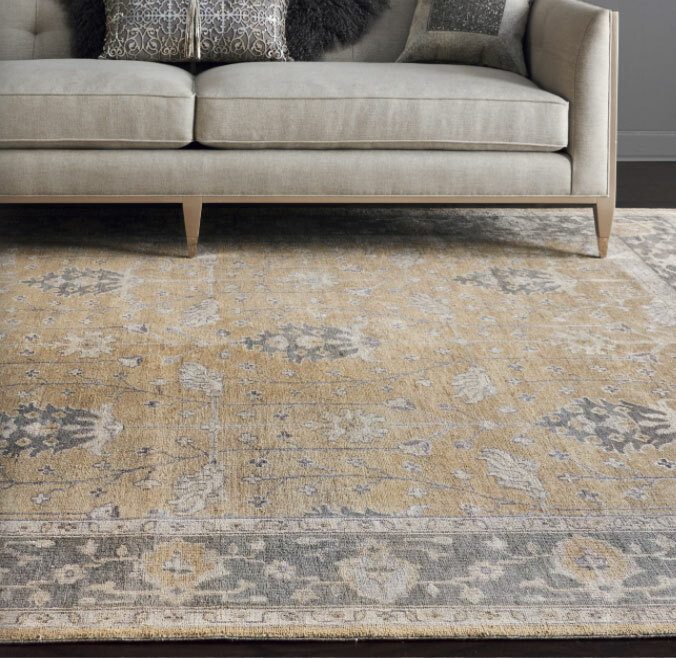 Like the lining inside your favorite designer jacket, this stunning hand-knotted rug ever so discreetly finishes up the elegant room. Either way, wool is a great choice for the living room, as it holds its shape and resists dirt better than any other fiber out there. If you’d like something a little fancier, a mix of wool and silk or viscose is a great choice for extra softness and sheen. 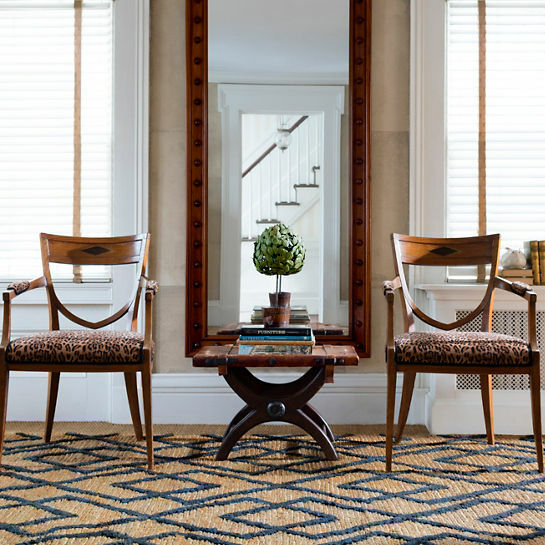 For a more casual feel, go with a natural fiber rug like a seagrass or a sisal. These super-popular neutral rugs add texture and just a bit of color, but be sure to clean them quickly as they will easily absorb stains. And by the way, did you know they came in lots of patterns and colors? Perfect for the beach house or for dressing down your fine antiques. 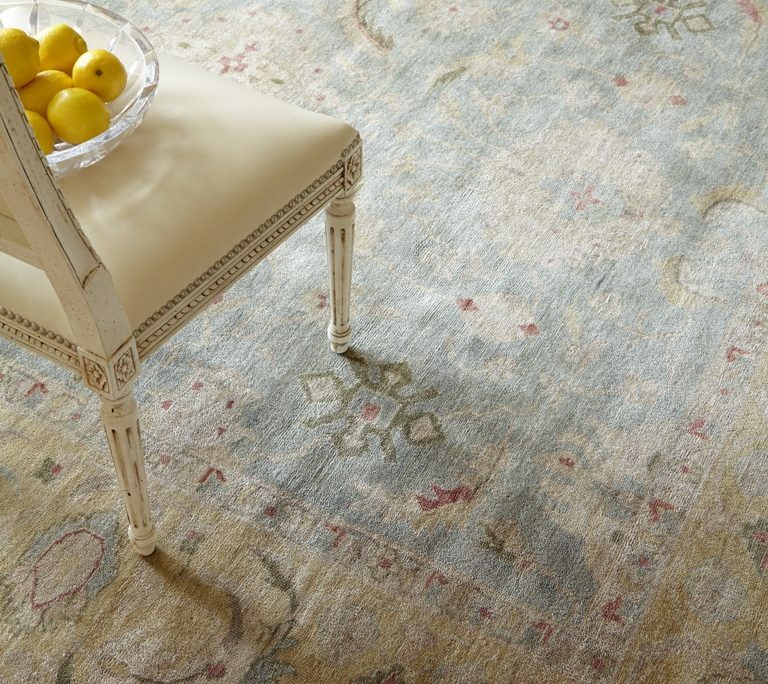 If your favorite rug is not large enough, layer it on top of a larger sisal or jute rug. If your living room opens onto an outdoor space and you’re concerned about foot traffic, divide your living room into two seating areas and leave the floor bare in between for walking. 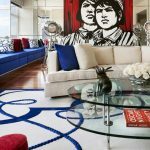 Remember that your coffee table will probably cover the center of your rug, so a rug with an allover pattern may work best in these spaces. 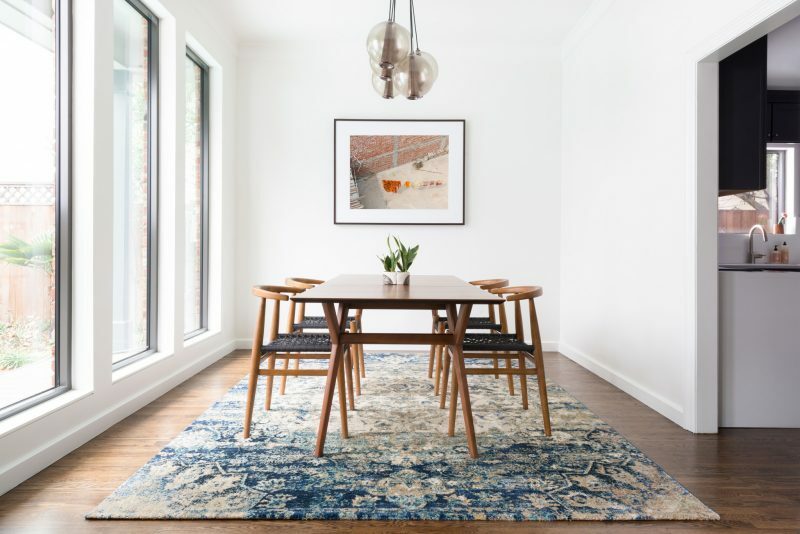 Dining room rugs can really help cut down on noise from moving chairs to lively discussions, but there are little tricks to make sure you get the right one. First, you have to get the right size. The right rug needs to cover the floor when the chair is under the table, when it’s pulled out, and when a person is seated on it. To figure this out, place (or mark the floor with tape) all the furniture in the room. 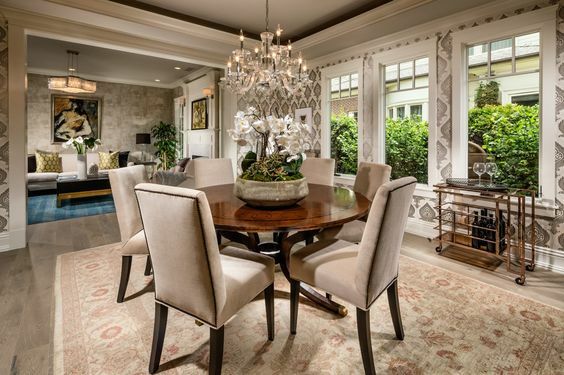 This includes the table and chairs, sideboards, bar carts, and large plants. Ideally, you want a rug that extends at least 24 inches around the table. And if you can, leave at least 18 inches of floor exposed between the edges of the rug and the wall. As far as materials, go with a durable wool (easy to clean) so wayward crumbs can be easily cleaned. If you have a more casual household or worry about rowdy guests spilling wine, consider an indoor/outdoor rug. These come in beautiful neutral patterns and can be taken outdoors to be washed. As an added bonus, outdoor rugs are great if you have pets! 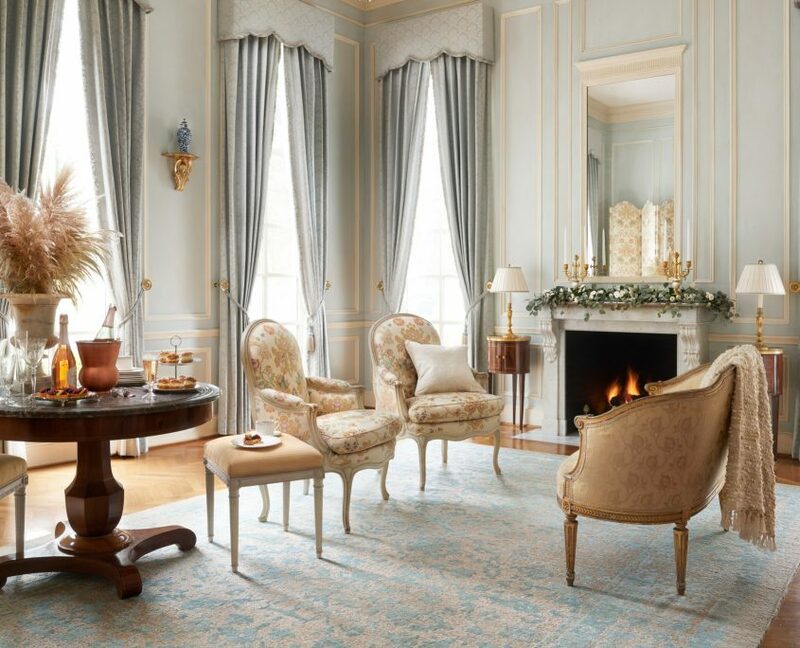 Save the finer silk rugs for the living room or the master bedroom. Also, know that while they look great, natural fiber rugs like sisal, jute, and sea grass are difficult to clean, so leave those for other rooms. 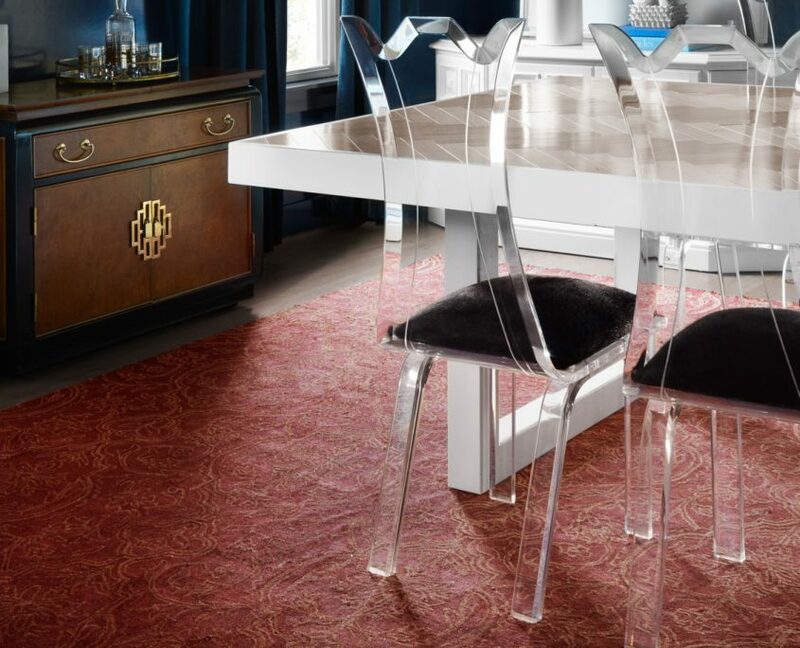 Select a low-pile rug (like a flat weave) for the dining room, as it will make it easier to pull chairs in and out. As an added bonus, crumbs are also easier to vacuum from lower pile rugs! The warmer colors on this rug just beg for you to linger, even as it hides last week’s spaghetti sauce accident. Master bedroom rugs should be restful. Avoid disruptive, loud patterns – unless you find zen with fuchsia. This is your private space (with lighter foot traffic), so you can go with a plusher pile (great for bare feet) and splurge on more delicate silk or cashmere blend rugs. You’ll be grateful every time you come home and every time you wake up. And for a more casual feel, go with a simple cotton rug. As far as size, learn from high-end hotels. They cover every bedroom completely with carpet for quiet and comfort. So choose the largest one you can to make the bedroom quieter. At the minimum, go with a rug that’s large enough to extend 24″ in length and width from the edges of the bed. That way, when you get up in the morning, your feet will be on the rug. In children’s rooms, pick something that’ll go with their decor. Better yet, have them help you choose it and they’ll remember to take good care of it. Does anyone in your family like rainbows? 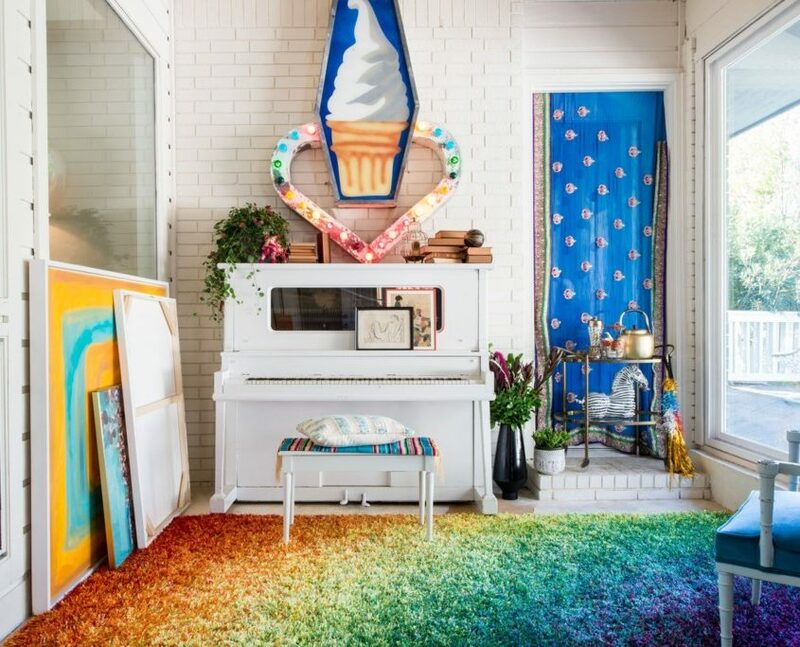 What a groovy, 70’s-inspired multicolor room … perfect for the artist in the family! As kids love to play on soft rugs, this will help keep their play area more defined. Plus, staying away from windows and the sharp corners of the furniture is always a good idea! Guest rooms should have low pile rugs, especially if they may need to accommodate the elderly. If you’re looking for a traditional look, go with wool. Otherwise, cotton lends a carefree feel. Either way, you want to make these rooms as comfortable and practical as you can. Remember that for those allergic to wool, acrylic rugs are a fabulous alternative. Although they don’t hold their shape as well (since they’re more easily crushed), they do look similar and are more affordable. An instant mini-makeover! 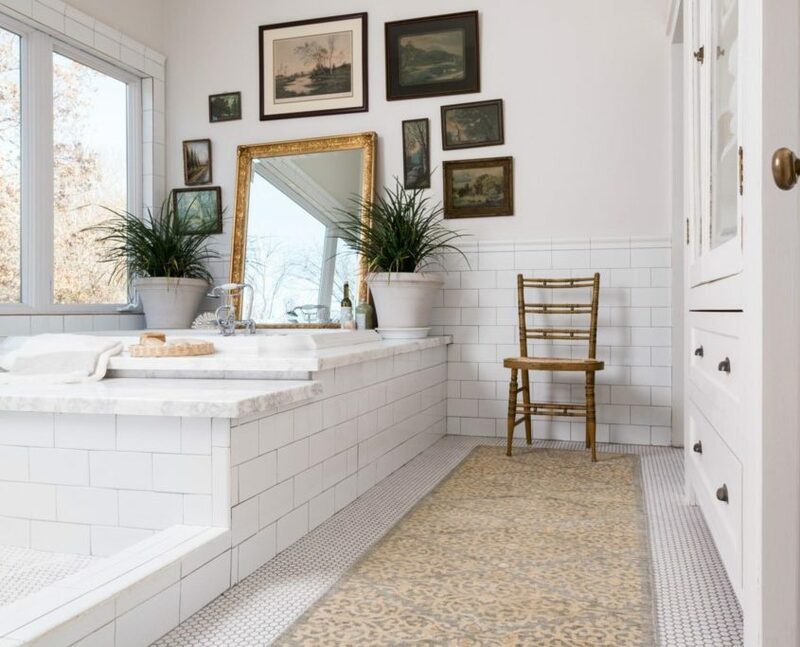 Warm up your bathroom with a rug, plants, and antique prints. You’ll have something warm to step onto. If you can fit an ottoman on top of it, it will create a restful seating area in the room. If you’re planning on washing it often, get a machine-washable rug. 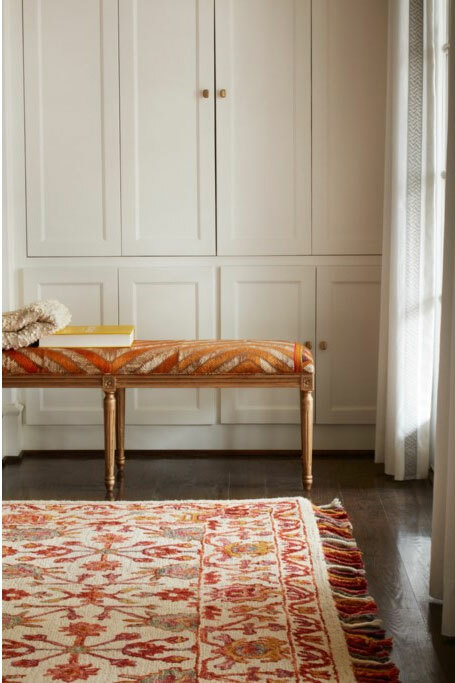 Think of rugs as the ultimate accessories for dressing up your closet. 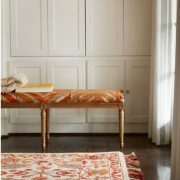 Here, this orange/berry rug really takes the ottoman to another level. Rugs are a great way to make your outdoor space feel as inviting as indoors. Outdoor rugs have come a long way from those plasticky things our parents used. If you’re looking for something super durable, water resistant, and UV-treated for fade resistance, go with a propylene rug. For something that feels a little more wool-like, look at PET rugs, which are made from recycled plastic bottles and really are quite soft. 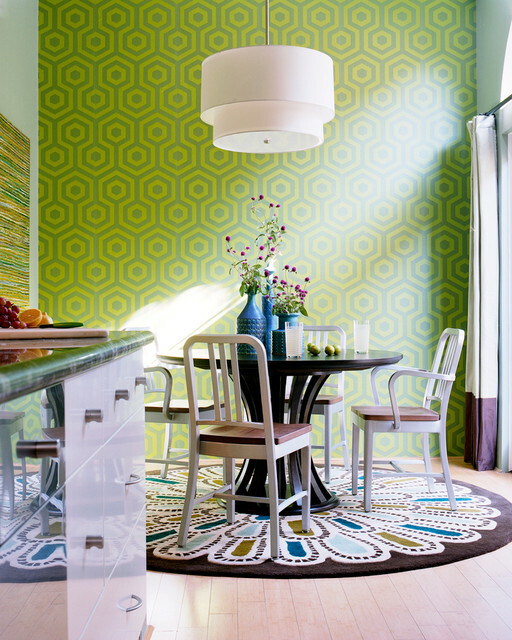 In areas immediately next to your home, stay with colors and patterns that harmonize with those inside. Why? Because they’ll visually extend the size of your space indoor, and who wouldn’t want a little more room without having to move? What a soothing outdoor space! Doesn’t it feel like you could sit here for hours with a drink and a good book? How could you not love this cozy boho outdoor space? Add some lanterns at night and it will be magical! Another advantage of strong colors is that they instantly create the right mood … this one tells me we’ll have a fun-filled pool party today! 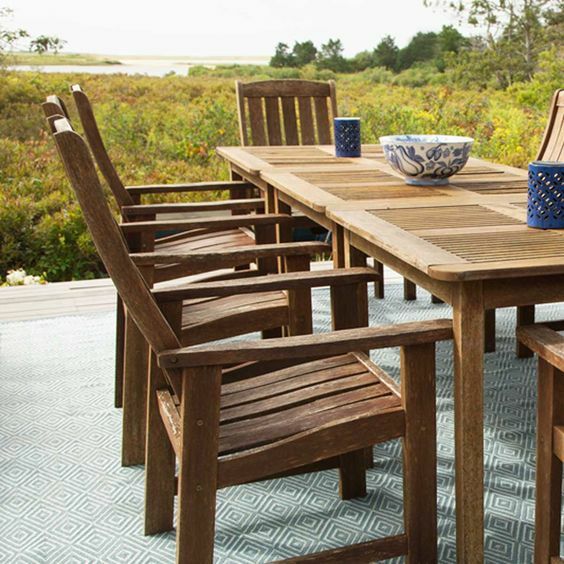 See how the bright rug draws your eye to the outdoor dining area? 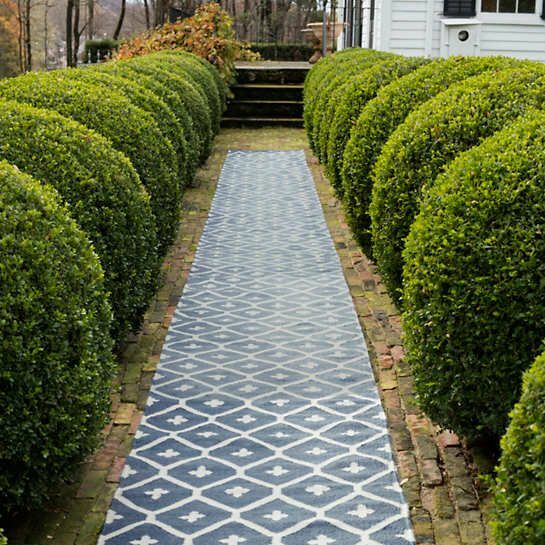 If you have different pathways around your garden, dress them up with outdoor runners. Here, the runner effortlessly ties the house and the garden together; plus, it makes it easier to walk if you’re wearing heels! The right rug will take care of you for years. So have fun finding the perfect rug, and be sure to share any tips you have with us! To see all our rugs, click here. Or try our rugs suggester to find your rug based on color, size, or room. Like this post? Sign up for our email list to get news and special offers! 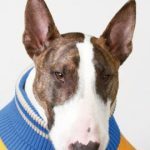 16 World Famous Interior Designers’ Tips on Area Rugs What Would Neville Jacobs Get His Dog Friends?